Celtic Raga: Matthew Montfort (guitar) performs traditional Celtic melodies and raga with tabla accompaniment. CNN broadcast part of their Summer of Love 30th Anniversary performance in San Francisco for a crowd of 35,000 . Video. >YTmusic (repertoire). Slavic Sounds: This program features traditional melodies from Eastern Europe and contemporary creations. Fronted by Irina Mikhailova, a vocalist, composer, and multi instrumentalist from Kazakhstan whose musical style reflects the traditions of Russia, Balkans, Asia and Middle East. Video. >YTmusic (repertoire). España Trio: Features Spanish and historically related Indo Arabic themes. Performed at Spain's Festival Internacional de la Guitarra to rave reviews in 2003 and 2005. Video. >YTmusic (repertoire). Indo Latin Grooves: Features compositions from Mariah Parker's debut release, Sangria, which blends the driving rhythmic syncopations of Latin jazz with the entrancing, asymmetrical meters of India. Includes musicians who have performed with Oregon, Sun Ra, and Herbie Hancock's Headhunters. Video. >YTmusic (repertoire). Indo Arabic Roots: Showcases concepts such as taqsim (Arabic melodic improvisation), tala (Indian rhythmic cycles), and compás (rhythmic structure of flamenco). Video. >YTmusic (repertoire). Arabic Beats: Middle Eastern music featuring Georges Lammam (Arabic violin, vocals). Video. >YTmusic (repertoire). Guitar-Sitar Jugalbandi: Jugalbandi is a classical North Indian musical duet, in this case with the unusual configuration of Pandit Habib Khan on sitar and Matthew Montfort on scalloped fretboard guitar. They have enthralled audiences in India, Lebanon, and the USA. Video. >YTmusic (repertoire). Indian Guitar and Tabla Duet: An innovative and accessible take on Hindustani classical music and contemporary fusion, with expressive and energetic renderings of raga and tala. Video. >YTmusic (repertoire). 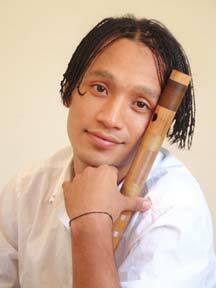 Himalayan Wind: Nepali flute master Manose is widely recognized as Nepal's premiere flautist. 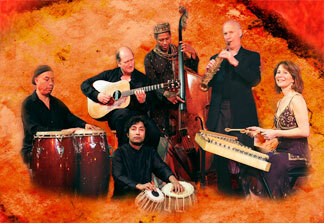 This program featuring him includes Nepali folk music, raga, and contemporary world music. They received rave reviews at the Trinity Tribal Stomp, Caspar World Music Festival, Himalayan Fair, and the Petaluma World Music Lecture Series. >YTmusic (repertoire). Asian Cultures: Showcases masters of traditional Asian music such as Bui Huu Nhut (Vietnamese monochord) and Zhao Hui (Chinese zither). Featured on the top selling Asian Fusion by Ancient Future, two Putumayo samplers, and the Rachel Maddow Show on MSNBC. Video. >YTmusic (repertoire). Asian Fusion: Same ensemble with a monster rhythm section. Video. >YTmusic (repertoire). 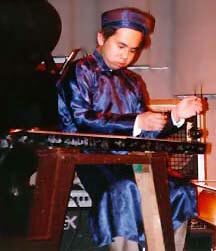 Chinese Classical: Features Zhao Hui (gu zheng, ancestor of the koto) and Matthew Montfort (scalloped fretboard guitar). >YTmusic (repertoire). Asian Jazz: Ancient Futures Asian jazz program includes Chi Music (Chinese jazz) by Liu Qi-Chao, composer and virtuoso performer on Chinese winds. >YTmusic (repertoire). Planet Jammin' Quintet: Five programs from one booking: Indian Jazz with Pandit Habib Khan (sitar), Trance Songs with Irina Mikhailova (vocals), Celtic Raga with Matthew Montfort (scalloped fretboard guitar), Guitar-Sitar Jugalbandi with Khan and Montfort, and the full quintet. >YTmusic (repertoire).